We all want our girls to look great and put-together when we send them out the door. However, we also deal with struggling to get everything done in the morning so we can get everyone out on time. 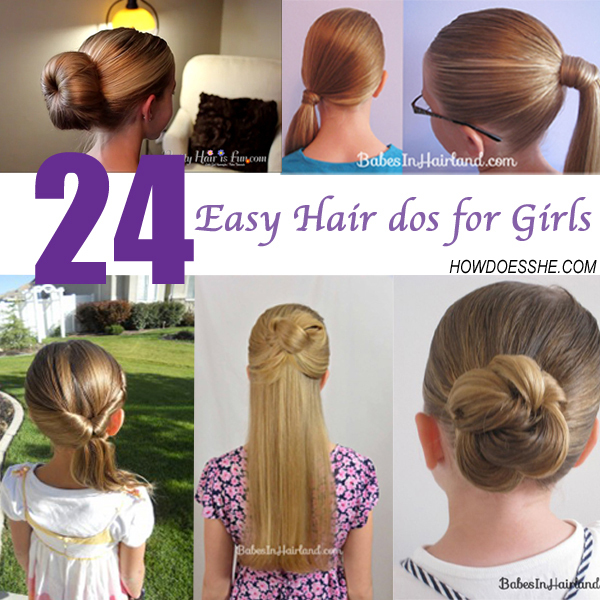 We have 24 easy hairdos for girls that will help us accomplish both of these things! Do you need some quick and easy hairdos for girls that make them cute, yet still get them out the door in time? Here’s our latest finds! 1-3. My oldest is loving the ponytail lately. Time to mix it up with these 3 quick and easy ponytail hairstyles. Here. 4. Buns are always fun! Get the details for the Loopy looking bun Here. I promise it’s not as hard as it looks! 5. Toddler “Hair bows” Here. Simply adorable and super easy! 6. Quick and easy hippy/bohemian hairstyle! Loving this one! Here. 7. 1 minute 3 bobby pins hairstyle Here. Gorgeous for a special occasion! 8. Twistback flip under. Cute style without many steps! Here. 9. Easy Hair Bun using a Bun Styler, bobby pins and about 5 minutes. With Video. Here. 10. Simple twist. Just used this one today for one of my kindergarteners! She loved it! Here. 11. The PERFECT pig tales. Here. 12. – 16. 7 Easy toddler hairstyles. Here. 17. – 21. Five tiny ‘dos. Here. 22. Running Late? This quick and easy hairdo will do the trick! Here. 23. Pony Tail Twist Here. Super cute for school or even a school dance! 24. Wrap your ponytail to cover your rubber band Here. Genius! There you have it! What easy hairstyles do you like to use? « The day that would not end…..
And the rest of the girls that do not have straight hair? I have a question. My mother always said you shouldn’t brush or rubberband your hair when it’s wet. I try so hard to do my little girls hair but without it being wet it’s a mess. Is my Mom wrong?